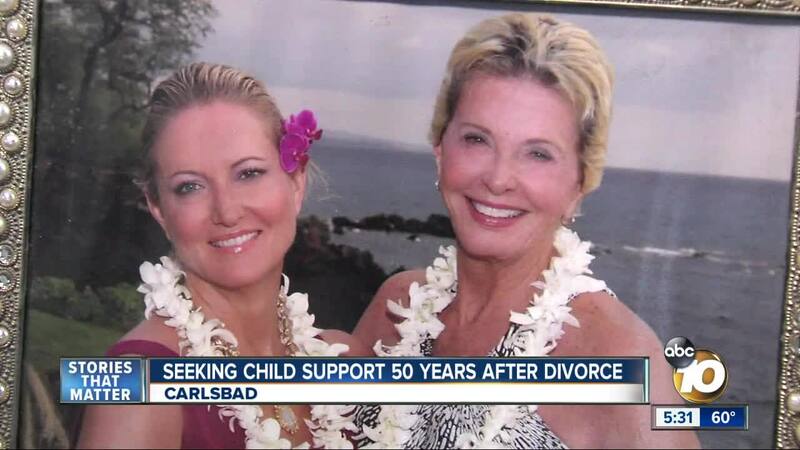 CARLSBAD, Calif. — A California woman successfully sued her ex-husband for child support for their now 52-year-old daughter, her lawyer claims. "I kind of put it on the back burner and just kind of forgot about it over the years," Anderson said. She supported her daughter while working as an interior designer in Los Angeles at a firm her daughter now runs. "I don't think enough women get this. And I think they're afraid," Anderson said. Along with getting what she's due, Anderson wants to the spread the word to other single parents in California: You can still collect. And to those who skipped out, her message is for them to watch out. "I think he's a little bit panicked.," Anderson said. "And I'm very happy because I was panicked all these years. Now, it's his turn." Toni Anderson's lawyer, Sara Yunus, Esq., an Associate Attorney for Antonyan Miranda, LLP, says a private hearing in Vista Court Wednesday resulted in a settlement of $150,000. The attorney for Anderson's ex-husband did not respond to a request for comment.